The birth of the Dauphin Francis was cause for great celebration, not only for his parents but also for the kingdom of France. After suffering three years with his brother in Spain as a political hostage, he grew up to be a fine young man. He was extremely popular and considered the greatest hope for the future of the Valois dynasty. Francis was born on February 28, 1518 at the royal château of Amboise. His father was King Francis I and his mother was Claude de Valois. Claude was not only Queen of France but held the title of Duchess of Brittany too. It was through her that Francis inherited the title. A splendid christening was celebrated on April 25, 1519. Francis received the required education for a young man of his status. Due to political practicality, Francis’ father needed an alliance with England. According to the treaty of London in 1518, the Dauphin was betrothed to King Henry VIII’s daughter Mary Tudor. However, by 1522 this alliance was no longer expedient and the engagement was over. Mary Tudor was then engaged to the future Holy Roman Emperor Charles V.
Early on in King Francis’ marriage to Queen Claude, he persuaded her to give him the right to administer the duchy of Brittany during her lifetime. Soon after this, the agreement was amended into a perpetual gift. 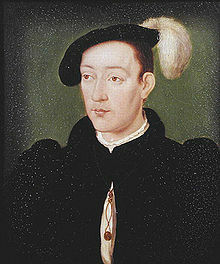 In her will made just before Claude died in 1524, she bequeathed the duchy to her eldest son Francis. He was still a minor so the king continued to administer the duchy. 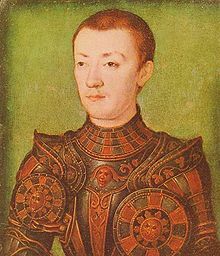 When Francis was nine years old, his father departed for Italy to fight for territory leaving his mother Louise of Savoy to act as regent in his absence. On February 24, 1525, King Francis suffered a disastrous defeat at the Battle of Pavia and was taken hostage by the Holy Roman Emperor. While the king was held captive, his sister Marguerite was sent by Louise to bargain with the Emperor for the king’s release. After many months of wrangling, Marguerite failed to make any progress. Just as she was leaving to return to France, King Francis drew up his abdication edict naming the Dauphin Francis his successor to the throne. It also specified that the Dauphin was to give up the throne if the king ever returned from captivity. Louise of Savoy eventually had no choice but to enter into negotiations for the release of the king. She brokered the Treaty of Madrid in January of 1526. Unfortunately, the Holy Roman Emperor insisted on taking the king’s sons hostage as a replacement to ensure King Francis lived up to the terms of the treaty. The King returned home and Francis and his younger brother Henri set out for Spain on February 17, 1526. The two boys were exchanged at the Spanish border for their father and were imprisoned on March 17. They would spend three long, grueling years in Spain under difficult conditions. The Holy Roman Emperor Charles V was insisting that King Francis cede to him the rich territory of Burgundy according to the terms of the Treaty of Madrid. King Francis had no intention of turning over this valuable commodity. Charles was downright frustrated by Francis’ stubborn refusal to give in. Charles thought the captivity of the young princes would be persuasive enough to get him to relent. It wasn’t until the summer of 1529 that terms were agreed to. Louise of Savoy and the Holy Roman Emperor’s aunt Margaret of Austria met at the small town of Cambrai to hammer out the terms. Louise’s main concern was the return of her grandchildren. The Ladies Peace of Cambrai ensured their return along with the marriage of King Francis to Charles’ sister Eleanor. After all the details were worked out, the two boys were escorted back to France by Eleanor. They arrived on July 7, 1530. Both boys were significantly emotionally scarred by their strenuous years of captivity. King Francis married Eleanor of Austria on July 4, 1530 and she was crowned queen the following March at the Basilica of St Denis. Both Francis and his brother Henri held Eleanor’s mantle during the ceremony. They also stood behind her as she sat on the throne with their hands on the chair. The marriage between Eleanor and Francis was contentious and unhappy although Eleanor was a good mother to all of the king’s children. Francis was the only one in the family who had true affection for Eleanor and he acted as her champion and advocate. A marriage considered between Eleanor’s daughter Marie of Portugal and Francis never materialized. 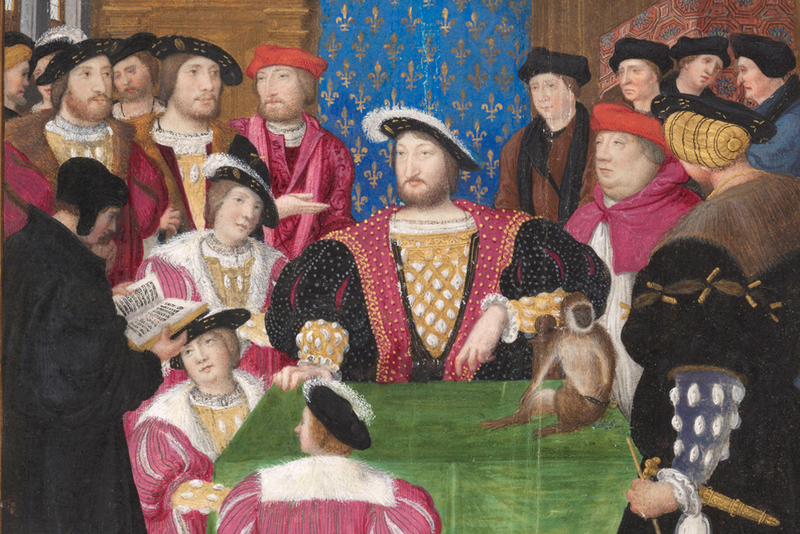 When Francis came of age in 1532, the arrangement between France and the duchy of Brittany needed to be regularized. Queen Claude’s will had only been endorsed by the Breton Parlement. If Brittany’s union with France was to be made permanent, the Dauphin’s right to the duchy had to be established beyond dispute. It was important for the people of Brittany to ensure there was peace for their rich and populous land. Brittany was coveted by the English and the French and their allies. Those who governed Brittany knew the French king would continue to make war on the duchy. The Chancellor of Brittany called a meeting of influential Bretons in Paris. Bribes and favors were paid by the French king to certain important Bretons to garner their support for the complete annexation of Brittany. The Bretons then met in Vannes to discuss the annexation. To maintain the peace, the Bretons asked that Francis make a solemn entry into Rennes as duke and owner of the duchy and that he swear an oath of office. They hoped to keep and maintain the rights, freedoms and privileges of their sovereign state. The king agreed to these terms. Francis began living in the castle of Suscinio near Vannes which is where the Bretons met to discuss the annexation. The king issued an edict, permanently annexing Brittany on August 13. King Francis also insisted his son be crowned thereby recognizing his ducal status. On August 12, Francis spent the night at the abbey of Saint-Melaine and then made a solemn entry into Rennes. The procession behind him as three hundred feet long and the colors of the Dauphin were worn by two hundred people. Along the procession route, scaffolds had been erected by the city. Mythological scenes were presented on these platforms which had political meaning to the Breton people. There was a depiction of King Arthur receiving weapons and an ermine coat from the Virgin Mary. Another showed the King being visited by the god Mars. In all these scenes, Francis’ mother Queen Claude and his grandmother Queen Anne of Brittany were never mentioned. The procession entered through the gate of Foulons. Francis rode on horseback, richly dressed in blue velvet with gold embroidery. The coronation ceremony began at seven in the morning in the cathedral where the prior Dukes of Brittany had been crowned. The Dauphin entered the cathedral. He was given the collar of the Order of the Ermine, the ducal sword and the scepter. King Francis had ordered a golden ducal circlet be made for the occasion. The Bishop of Rennes placed the circlet on Francis’ head as he sat on the throne. 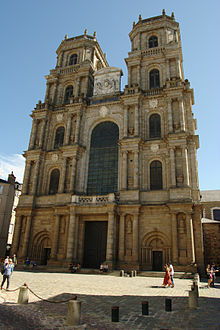 The Bishop of Rennes and the governor Baron de Laval administered the oath to Francis which he swore on the Gospels, “to maintain the ancient rights, privileges and liberties of the Church, the nobility, the cities and the people”. The new Duke received the keys to the city. He was placed under a canopy of blue damask and satin lined with ermine and sown with lilies which was carried by four gentlemen. At the door of the cathedral, the crowd shouted “Long live the Duke”. Francis then heard mass and retired to the episcopal manor adjoining the cathedral. The next day he left Rennes without receiving homage from the nobles of Brittany. He would never return. Whatever initiatives Francis wanted to adopt for his duchy did not make his father happy. King Francis continued to administer the Duchy either with or without Francis’ consent. Brittany gained security and managed to retain its best privileges but the duchy lost complete autonomy and from that point on was considered a province of France. On August 10, 1536, Francis was playing tennis at the castle of Tournon. A storm arose and he stopped playing to have a drink of cold water. The glass was handed to him by Sebastiano de Montecucculi, an agent of the Holy Roman Emperor. Francis died shortly thereafter. Rumors of poison arose immediately while others argued it was dangerous to drink cold drinks after becoming overheated. Montecucculi was later found to have incriminating documents in his possession, including an imperial safe conduct and a book on poisons. At the time, Italians were considered specialists in the art of poisoning. Montecucculi was taken into custody and initially confessed under torture to poisoning the Dauphin. He later recanted his confession but he was still cruelly executed on October 7 in Lyon. The French government accused the Emperor and the imperial governor of Milan Ferrante Gonzaga of instigating the murder of the Dauphin. They both vigorously denied the charge. The government also accused Catherine de’ Medici, the wife of Francis’ brother Henri. The most likely explanation for the Dauphin’s death was tuberculosis or pleurisy which he probably contracted while he was a prisoner in Spain. Francis was initially buried in Tournon. When King Francis died on March 31, 1547, the new King Henri II decided to have a triple burial with his father and two brothers Francis and Charles. All three were interred in the Basilica of St Denis in a newly constructed family mausoleum. Susan, I’m sure you have researched all this very thoroughly, but in my reading as well, given the opportunity women were frequently able to serve as diplomats in Medieval society, Thanks again for a great article. Very interesting role of women in this story. It seems that when women had any power, they tended to use it in kindly and sensible ways. Who better than a loving grandma to somehow spring grandchildren from prison? As for poison in a glass of water, I have to doubt it. It would be hard to disguise the taste and even the appearance. What a turbulent life for a promising young man, and what a sad end. Yes Claudia. King Francis I in particular allowed women a wide range of roles in his court. A very Renaissance king! As far as the poison, I doubt it too. Consumption was the scourge of the Valois monarchs. I had no idea that women were ever sent to conduct diplomacy in this period! Do you by any chance know whether Louise of Savoy was exceptional in this regard? P.s. the term ‘Dauphin’ always makes me think of the wonderfully funny ‘1066 And All That’ (well worth a look if you haven’t read it): “The French King, being mad, entrusted the government of his country to a dolphin”. Yes Caecilia! Women were very active in diplomacy, especially on the Continent. In this case, Louise of Savoy sent her daughter Marguerite to the HRE Charles V. Louise herself and her sister-in-law Margaret of Savoy brokered the Ladies Peace of Cambrai. Margaret acted as regent for her nephew HRE Charles V. I’m sure there are many more examples. Sarah Gristwood has a new book coming out soon about these formidable Renaissance women. Cute quote from the book. I cannot locate any information on why the Counts of D’Albon included a dolphin on their coat of arms. Heraldry is not my area of expertise but that is where the title comes from. A very unusual choice!